When i set off to walk from Munich to Paris in early November one of the aspects of a long winter trip where i would be sleeping out in a hammock under a tarpaulin for more than a month were the long hours of darkness. I was apprehensive that spending more than 14 hours a day in darkness would be oppressive, or boring, or genuinely take me off into corners - dark corners - of my mind that i'd rather not visit or revisit. shadows of forests and fields against the sky. The wet road shimmered as a slightly less dark darkness. I loved it. There was a full moon that night - obscured behind clouds but just once or twice shining through a rip in the sky. started walking into the night from choice. Long marches through old forests. 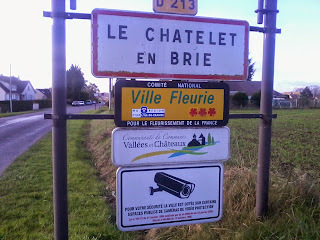 Trotting through silent, darkened villages. Following roads as the traffic slowed. My senses became sharper. I often didn't need to snap on my torch for several hours at a time. ground or in my hammock, with a light sleeping bag and all my many layers of clothing, under the tarp. Were they oppressive? Not at all. I often fell asleep within minutes of getting into the bag - sometimes as early as five in the evening just as the light faded. Sometimes past midnight. But i always woke up in the early hours. But not in the worried in the black dark hours' way i had feared, but in a floating lightness. Tawny owls love cold clear nights and they were the soundtrack for the nearly the whole trip. But i heard foxes. Muntjac deer. A much larger owl - the deep booming of an eagle owl. Wild boar crashed around me on several nights. But it all seemed perfectly natural. untroubled by activity or the need to do anything physical was a time of happy reflection and wake-dreaming and memories; sometimes it was almost trance-like. I could remember friends and people close to me in every detail, but also unexpected events came back to me in total recall. Various things i had been troubled by during the days - and in a few cases - over far far longer periods would seem simpler and solutions obvious when awake in the middle of the night. I would go so far as to say that sharing my walk between hours of dark and hours of light made it easier not harder. clouds revealing and hiding its light. So, today's solstice means i'll have to get more night walking and night waking into less and less hours of darkness for the next six months. Singing - the least embarrassing way of talking to oneself out loud. rap, chanson, flamenco (? ), and Europop. wonderful, and unsuspected, echo that beats any shower). Mornings, She Belongs to Me and Song to Woody came up a lot. Behan's The Captains and the Kings. Simple pleasures. And one of the least offensive, really. because it's a great song, was Jimmy Buffet's 'He Went To Paris. '...some of it's magic, some of it's tragic but i had a good time on the way. I got to Notre Dame cathedral in Paris late yesterday evening. A totally arbitrary finish point. But not as corny, nor quite as far, as the Eiffel Tower. The last day was a 14 hour non-stop forty mile hike. There was frost, wind, sun, rain. My ankle, though complaining, held out. Some eejit tried to mug me on the quais in the last mile to Notre Dame and was most surprised by my spirited response. And having missed the night bus back to London I slept in a patch of brambles in the Bois de Boulogne. And got on the bus to london this morning. I think, all in all, it was a joyful month of walking, but to be honest, at the moment, it feels like it never happened. 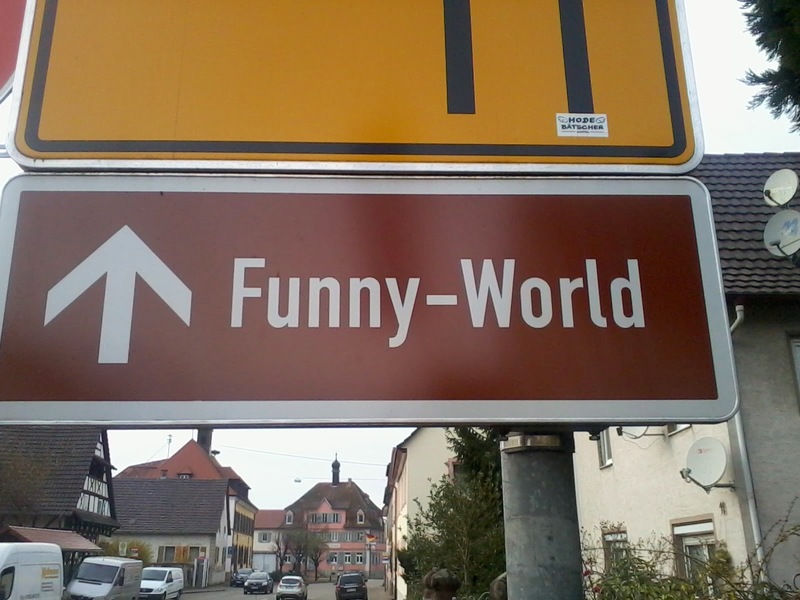 But then it's a funny old world out there. Working my way across the cheese-board, I'm in - security conscious - Brie. Less than forty miles from the centre of Paris, and if it wasn't for my pesky ankle within a long day's walk. I'm still striding along and it doesn't seem to be getting worse - just stiff and painful. I've cut up a sock to make a padded cuff which helps. Herzog had a similar problem at this point and roughly the same solution. He then walked through the night and well into the next day to finish his walk. A bit too extreme for me. And besides I'm still enjoying the walk - despite the hobbling and sudden drop in temperature. Last night I walked on from Carlos' bar and up into the huge Villefermoy forests. A comfy bed of beech and oak leaves, tawny owls calling, soup in bed and deep sleep. A bit of rain in the night, and dry again by dawn. Instead of rushing off I lay in bed writing, brewing coffee, looking at routes on the map and mulling over the trip so far. Slightly saddened it was so close to an end (chicken counting if ever). When I emerged from the forest and back onto the road I found a slew of warning signs along the next twenty kms of dead straight walking meant to deter my kind of trespassing, and particularly poaching deer. Rabies, traps, prosecution, live ammunition etc. (Actually the one I've liked best was in a previous stretch of forest; 'process verbal.' - a good shouting, I suppose.). Probably my biggest risk was being shot by the tens of hunters out on a big drive for wild boar. Jeeps and Land Rovers shot by along the roads dropping of gunmen on the long open tracks through the woods. They were all dressed in the drabs and camouflage colours of the outdoors, an effect rather spoilt by covering the lot with high-viz orange waistcoats. Prudent though. There were frequent barrages of shots and high-velocity bullets must have been twanging through the trees like hail. In dark colours and made lumpen and boar-like by my rucksack I felt amusingly vulnerable. What are the chances? Well, obviously high as it turns out. 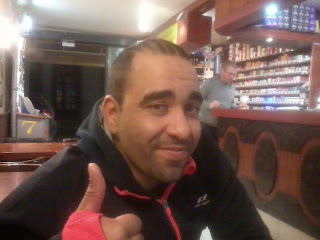 The photo is of a happy looking Kader Boujnane, who's just finished the third day of his four day, 400 kms run from central France to Paris. He and his team (note to self, must get a team) just turned up to eat. So, he's done half the distance I've done in a mere four days. And he's still full of energy. But you know I was moaning about my ankle being a bit swollen and painful - well he's got the same problem but his swelling is massive and he's hobbling yet still going to run the last stretch into Paris tomorrow. So, I'll shut up complaining and get back to walking. I'm seriously impressed by the guy. Another long stretch without a café and so without wifi. From leaving Troyes on Wednesday evening till midday today, Friday, walking through - counts on map - ten villages not one bar or café in over 50 kms walking. 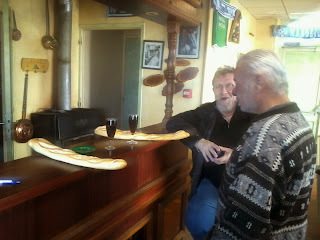 Then in the small village of Fontaine-Fourches a boulangerie with - genius - a café/bar attached. No wifi, but that was actually in it's favour. Locals dropped in for a baguette and stayed for a glass of wine, or came by for a calvados against the cold and decided to buy a few croissants. Brilliant. I was creating some filmic scenario in my mind about the owner - there were photos of jazz musicians and classic b&w pictures on the walls. It was like a film set. And Margaret could have been played by a Bardot type. Except she's not French but Polish from the Carpathians, and we ended up talking about how the mountain town of Zakopane has changed since I first went skiing there in the '80s, and about horses and Gorale mountain culture. 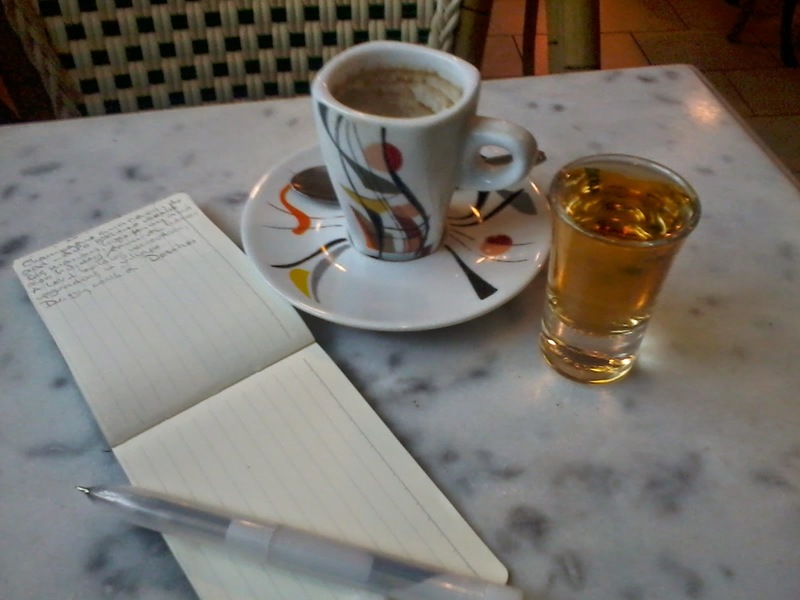 And if I'd got onto the slippery slope of just a small calvados I'd be there still. 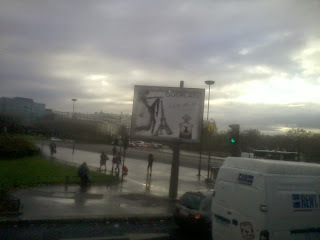 But Paris is so close. Which is just as well - the weather is changing. I may have woken after a night swinging above a genuine mud and water bog in my hammock to sun but the temperatures are falling, grey clouds veiled the sun, perhaps for the rest of the walk, and snow is forecast for the weekend, so in the coming days. And one foot has turned bolshie - the front tendons have had enough and are swollen and painful. I can still trot along happily on flat ground but rough going is...er...unpleasant. 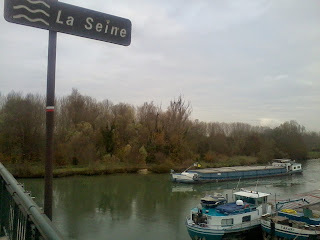 Unfortunately when I reached the Seine at Bray-sur-Seine, the river's 'bassee' - a wide stretch of river, channels, canals and marsh - the only bridge and road was effectively an eight mile causeway with speeding traffic and only a narrow verge to stumble along blinded by headlights. Most of my curses were muttered, or lost in defiant and uplifting song, as my dodgy ankle turned and rolled on tussocks and ruts and holes. But when I hit the odd bottle thrown into the rank grass and my foot twisted right over my swearing could have been heard in Paris. Yet, of course, the road came to an end and now I'm in Donnemarie-Dontilly (I've taken to calling it Osmond-ville). And the first bar I found is the Au Bon Coin, run by the ebullient Carlos da Costa from the north of Portugal. He's set me up with wifi and a very nice Alentejo wine, and I'm enjoying the ambience of a happy southern bar - laughter, joking, fabulous aromas from the kitchen. The place is busy. Polish. Portuguese. No conclusions but just saying. A blast of freezing air comes in every time the door opens. From here there's twenty kms of forest, then twenty kms of busy countryside and then I'm on the very outskirts of Paris and only a long walk from Notre Dame my randomly picked ending. I'll walk for another hour into the forest and then make camp. I keep jiggling and testing my annoying ankle and it doesn't seem any worse than it was twenty kms ago. I reckon it'll do. And on the bright side, usually by this time it's my back that's aching from my minimal but not minimal enough pack. The ankle has driven the back into second place. Oh, and tonight's packet soup isn't a soup at all but a veloute of cress and potato. There seems to be no such thing as a simple packet 'soup' in France - they're always the more exact potage, consomme (pointless from my point of view), bouillon, etc. 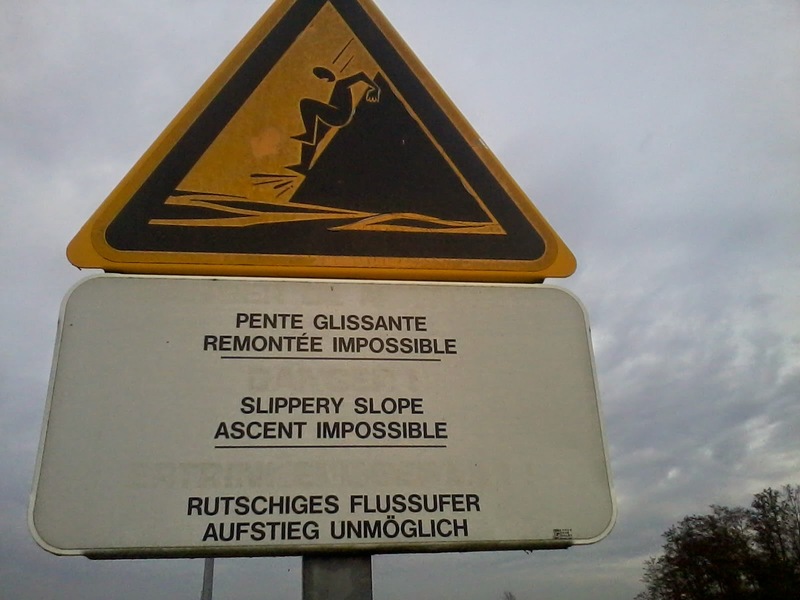 You got to love France. Yesterday was one of the longest stretches without a café, boulangerie or refuge of that nature. But it was a day punctuated by kindnesses. 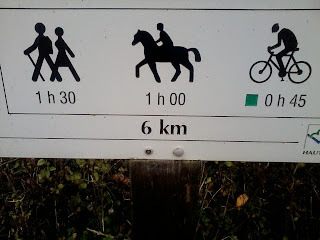 I'd decided to dog-leg through the Natural Parc de Foret d'Orient. Actually its lakes were only created in the 1960s but they've been enthusiastically adopted by tens of passing rare bird species as wintering waters or migration stops. Or so I had to believe. The day was grey, drizzly and cold. Not a bird to be seen. Some distant calls - cranes? My totem bird. Or geese? In the parc information centre the very helpful Valerie gave me a printed bird list (I was writing it out by hand from an info book) and a shot of wifi. As well as the bad news - not a café or bar before Troyes some fifteen miles away. 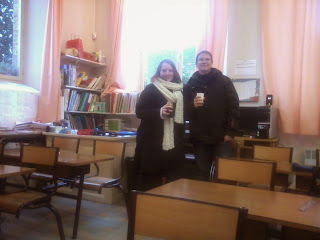 But in the next village, Geraudot, a hopeful enquiry about coffee saw me invited into the village school by teachers Aureli and Cristal (that's them in the pic) for a hot cuppa and a tangerine. Remember your own school days when you were around eight years old? That's how thrilled the 25 or so kids were by this unexpected apparition and break in routine. I hoped I was going to be asked to address the class; 'ok guys, to be honest formal schooling's a bit overrated - get ahead of the game and hit the road young...' Wisely, this was not to be. They were sent out to play and the teachers and I talked about a common theme on this walk - the atrophy and death of small villages. Without a café or bar, said Aureli, a village loses its heart. And the same without a school added Cristal. My cue to praise their happy, warm, book filled, painting hung one-room school. And their polite, interested pupils (quite a few came back to ask me how far I'd walked, whether it was cold and whether out was lonely walking all alone. It is a lovely school, said Aureli, it's being closed next year and the children will be bussed to so bigger school. I walked on. It was just freezing as dusk fell. And from the glistening expanses of ploughed field and harvested maize praries tens of cranes lifted off into the air and flew up over the woods and back to the lakes. Making the same joyous calls I'd heard earlier. In the dark I stopped in a small village to ask a woman the way. Without hesitation she - Madame Berthelin - asked me into her warm kitchen for coffee. Another 'pilgrim' had come by the year before on his way to Santiago. She assumed I was off to address myself to the Marie who was honour-bound to provide or find lodging for the night for genuine pilgrims. How nice, how medieval, how tempting. But I'm not that kind of pilgrim - my walk is more selfish and individual, (though no longer totally so - sometimes the journey starts before ones cause is found). I walked for another hour or so, until I looked down on the lights of Troyes, then found a copse on a hill and burrowed under the thick ivy choking a walnut tree. This kept some of my heat in and most of the rain off. 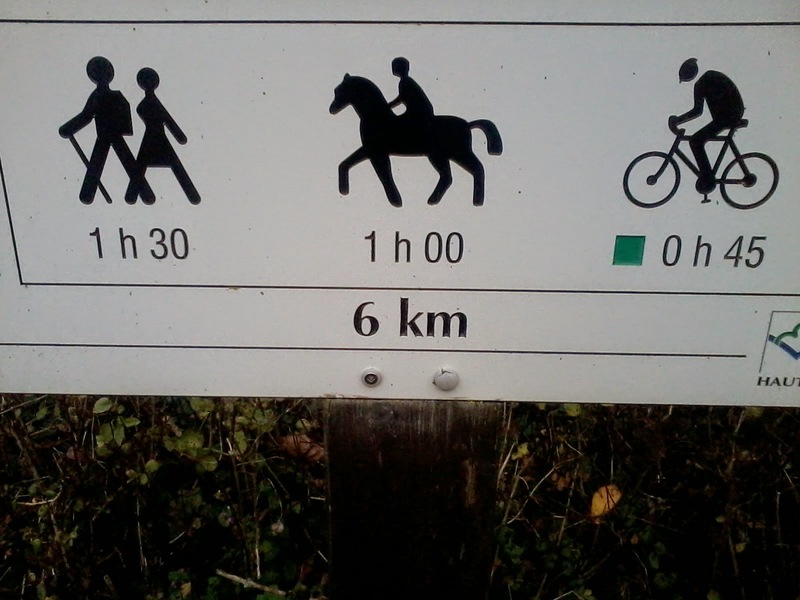 As the picture suggests I would be making better time on a bike or a horse. But I'm off cyclists - especially the leisure variety who take their cycles somewhere by car and pull on those daft leotards (giving the average middle-aged man the silhouette of a skinned frog with sinewy legs, pot-belly and goggle-eyed head and the inane Galvic action of the same frog hooked up to a battery; I'm against cyclists in their silly pretend-pelatons because in 400 miles of walking not one has responded to my cheery, one road user to another greeting. And I've been whirled past by tens of the beggars. Few going any faster than I go on my twenty year old ATB, fully laden with a weeks supplies and whilst singing happily. Travelling with horses is wonderful and what I've done most of. But in exchange for the five or six hours of being carried along one spends the next eighteen hours looking after the nag's board, lodging, health, feet, tack, happiness and much more. When I left Bar-sur-Aube in the early afternoon yesterday it wasn't quite cold enough for the forecast snow, so I walked 18 miles of forest and then exposed hill tops and into the evening beside a busy road in freezing drizzle and then rain. On top of one hill with a fringe of forest below on all sides like a monk's tonsure I lifted my head and howled wolf like for ten minutes and then despite my pack ran out of sheer joy along the road for a while. The joy was tested somewhat by the continuing rain. I found scant shelter in a wood of bare branches and put up my tarp and the hammock under it, so was at least dry-ish for night. It was worth paying double for the classy packet soup - lumps of lard in amongst the vegetables. It rained all night and into the morning. I sat in my hammock till nine and then in a dryish spell packed and got on the road. It started raining again. Cars sped by even though I'm in the national park forest. I sang loudly in defiance. 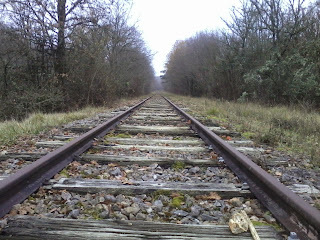 But it was suddenly much closer to Herzog's experience than my walk has been so far. And even more so now I've learnt that there isn't a café, boulangerie, shop or any succour between here and Troyes, some fifteen miles away. 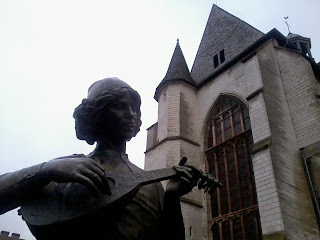 I've reached Bar-sur-Aube, within striking distance of Troyes. From there I'll feel like I'm on the last leg - still a hundred miles to reach Paris but it should be achievable. Herzog was in a bad way at this point from reading Vom Gehen Im Eis/Of Walking In Ice. He's been battling extreme weather for weeks, sleeping rough and with poor clothing. He's also walking immense distances - the difference between a sustainable mileage day after day and walking to breakdown is only a few extra miles per diam; I'm taking four weeks to do the five hundred miles and feeling fine (so far); Herzog took just over three weeks and at this point his journal tips in and out of observation and crazed flights of fancy (or hallucinations?). 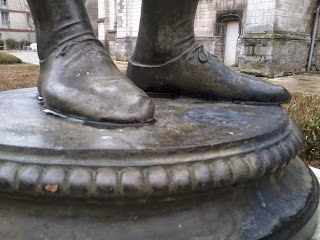 His feet are miserable. My admiration for him and for his feat is huge. But Herzog had something I don't have; a single-minded focus. He's walking to Paris because he sincerely believes that by doing so film critic and his champion, Lotte Eisner, will survive a serious illness. I, on the other hand, have no such goal. It's about the journey not the destination. Paris will be a bit of an anti-climax - I've nothing to do there but climb onto a Megabus or Eurostar machine and be whisked away. 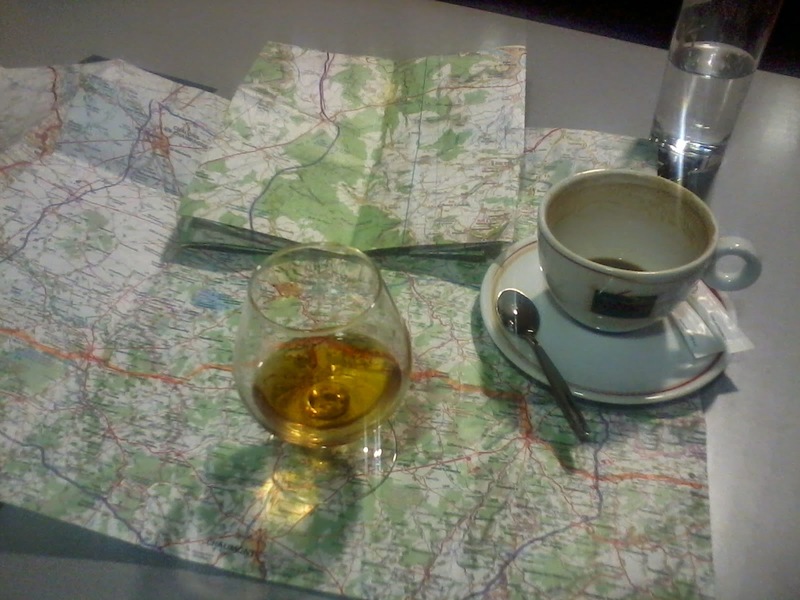 So unlike Herzog as the temperature drops here and it threatens to snow I'm happy sitting in a bar - the warm, welcoming Fer du Cheval - with my maps and a cognac planning the coming day's walking. Or as much the night's walking. With darkness falling at five I've become a nocturnal rambler - my best walking time, trotting down the tunnel of light from my head torch, or as often without torch on using night vision down tracks and through woods. Fox eyes, boar smell, muntjac barking, rustles and scamperings. Herzog took a detour to Greux to see the birth place of Joan d' Arc. Not my thing. 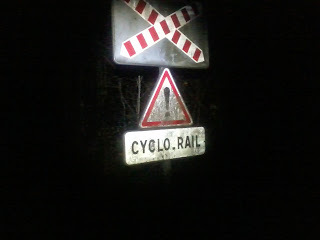 But I'm dog-legging through the lakes and woods of the Foret d'Orient - a wildlife paradise - tonight en route to Troyes. As I left the hotel bar last night, after yesterday's post I caught the headlines in the local paper; wolves confirmed in the Haute Marne. Indeed, one shot so very confirmed. I thrilled to the idea of wolves - big wildlife to go with the big wilderness of forest and mountains I've often been in since leaving Munich three weeks ago - out there with the boar and deer as I set off to walk through the dark and later find some woodland to sleep in. Well, can't sit here forever moving my glass of cognac along potential routes for the coming days. Or perhaps I can. After all I'm not Herzog with a pilgrim's need to get to Paris. Or, indeed, to get anywhere. My lucky coup - discovering the decommissioned railway line running west yesterday - carried me on into the night for another ten miles. This section is used for as a cycle-train route - I assume some kind of pedalled contraption that runs along the rails that one can hire. In the dark of a November evening there was none of that going on. But it meant that there was a cleared path beside the track - which was great; however romantic the idea of trotting along on the railway ties might be the actuality is hell. They're spaced too close for anything other than a tiring mincing skip, and they're slippery and between them are ankle-twister ballast rocks of billiard ball size and rollingness. But with the path I made good time. Just as well that yesterday was such a jolly experience and with twenty-five miles knocked off because today's been the first tinged with a touch of the grim. Good start with a few more miles from my woodland bivvy to end of rail track. 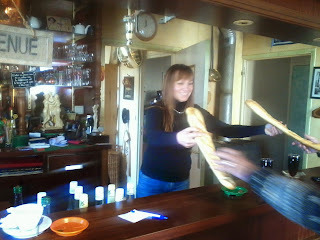 Then not one but three - open - boulangeries within a few kms of each other (being fair I bought something in each one). But then it was a seemingly endless footsore sixteen mile trudge up and over a long barren series of rather high hills along the verge of a busy-enough road. And all in freezing fog. Dangerous, dull and couldn't see a thing bar rubbish in the grass at my feet and the lights of oncoming traffic. The village I passed around lunchtime was dead and seemingly just a series of mostly abandoned houses either side of the same busy road. I hunched in a doorway and boiled up water for a cup-a-soup and had some bread and cheese (a rather petit Munster, as you ask) and then trotted on into the gloom. Now I'm in a smart hotel bar in Colombey les Deux Eglises, site of the memorial and museum dedicated to Charles de Gaulle. And feeling much jollier. Apparently, I'm that easily cheered up. Then again, the whole 500 mile walk is really about appreciating life's essential needs. I texted something along those lines to Dave Flower (mentioned before in these posts; lender of sleeping bag for this trip, and co-Danube paddler in the past). ' I walk, eat, sleep - that's it,' I wrote. But he's right - and it's a simpler description of this walk's rewards than my rambling on about randomness and immediacy in yesterday's post. It is an animal existence. But that of a happy animal. But trotting along in this grimmer weather and getting overall a bit jaded (I've been sleeping out with minimal kit and walking full mileage every day without a break for over three weeks at this point) helps me understand Herzog's walk and attitude better. If I'm a happy dog having a hound's holiday, quite often distracted by things along the way and trying to stay reasonably comfortable, Herzog was like a wolf totally focused on hunting down Paris, loping along doing incredible mileage each day, impervious to far wise worse weather, sleeping rough wherever he has to. A biologist studying wolves in the wild told me that one of the sure signs that one was following a wolf and not a large dog was that a wolf decided what it was doing and where it was going and then just moved as straight and efficiently as possible. A dog would get distracted my a smell, or head off track out of curiosity, or stop for a while, or have a roll. Sort of the point I was making above. It's now dusk. The only way out of this town - and I need to do another eight or ten miles tonight, then find somewhere sheltered to set up my tarp - is on the same busy, fast, foggy road I came in on, or out on a small hilly road that takes a far longer route. What would a wolf do? What would a dog do?